Discover our picks for pet friendly hotels in Jackson Hole and top 10 dog friendly activities, hikes and walks. Pet friendly hotels, lodging or accommodations can be hard to find sometimes, but Jackson Hole has a good selection of pet- and dog-friendly hotels that will welcome you and your family with doggy treats. Imagine this: You bring Fido along with you on your vacation, excited to share your outdoor paradise adventure with him. It was easy to find pet friendly hotels in Jackson Hole, Wyoming, so the rest of the vacation should be a breeze too, right? Problem is, not even dog friendly Jackson Hole is as enthusiastic about your four-legged friend as you are. “No dogs allowed” signs greet you way too often in parks and at restaurants. In fact, in nearby Grand Teton National Park and Yellowstone, strict pet regulations and laws keep man’s best friend off the hiking trails and have ruined or held back many a vacation. 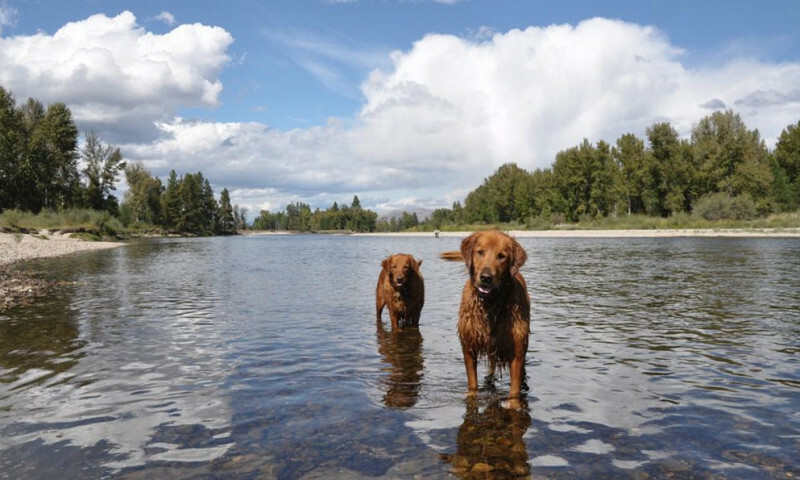 Below you’ll find 10 of our favorite dog-friendly things to do in and around Jackson Hole so your dog-friendly vacation doesn’t go to the birds. If you want to take your pup to see some spectacular backcountry Teton views, Table Mountain may be the best hike to do it since all park trails are barred to dogs. It’s also a bit of a drive from Jackson. Plan a little more than an extra hour each direction for travel. The whole trail is barely outside Grand Teton National Park so you don’t have to abide by park regulations. And you’ll have plenty of water access for your dog as you ascend to big mountain views where you’ll feel on top of the world. Gain your elevation in the car on Teton Pass and enjoy the high country with your furry friends. Ski Lake is one of the best-known hikes in Jackson Hole that both dogs and people love. Take an easy hike through aspen groves, wildflowers, evergreens and mountain meadows to a cliff-ringed jewel frequented by moose. If your dog’s a swimmer it will love Ski Lake. If you aren’t up for an epic wilderness trek but want to get your dog out for a brisk walk in a beautiful area, Cache Creek or the connecting Game Creek could be your go-to. 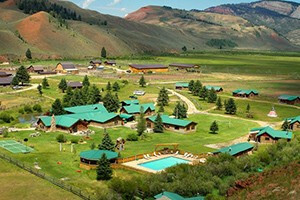 Enjoy unique mountain views, a blanket of wildflowers and a vast network of trails and boardwalks that weave through the forest and along the pristine Cache Creek and Game Creek. All within a couple minutes of downtown Jackson. Watch for mountain bikers in the summer, cross-country skiers in the winter and wildlife all year. Take your dog for a flat walk along a gravel path on the braided Snake River with a distant view of the Tetons. A popular destination for dog walkers. From November 1 to April 30, Grand Teton National Park shuts down its inner road — the one right by the gorgeous mountains — to all motor vehicles. That makes it one of the best places to walk a dog in the valley (with a leash.) In November and April only, the road’s even plowed so you don’t have to bring along snowshoes. Head across the National Elk Refuge and into Curtis Canyon for a pretty ridge trail that takes you straight to Goodwin Lake. This wilderness gem is a great place to rest up, fish and/or swim before bagging Jackson Peak with your four-legged companion. Rendezvous Park is the only park in Jackson partially opened to dog walkers. The park built a special-use perimeter trail in 2017 to allow dog owners to enjoy the park along the Snake River. The trail leads to the Snake River, where you’ll be able to chill on a bench and unleash (literally) the doggy beast. Warning: you’ll probably get some wet dog smell as a result. Slide Lake is named for a historic slide that interrupted the flow of the Gros Ventre River and built a natural dam that was later knocked out by high flows and pretty well wiped out the small town of Kelly. History aside, it’s a great place to relax by a lake, fish and watch your pup happily playing in the mountain water. And if you care to explore, the Gros Ventre Wilderness has tons of dog-friendly terrain. Snow King, the Jackson Hole ski area that looms above downtown, packs a punch in the summer months for a quick morning hike, jog or walk with the dog. Climb through surprisingly lush forests to the summit at Josie’s Ridge for a spectacular view of Jackson Hole, Flat Creek and the Tetons. Then let the pup cool down in Flat Creek once you’re back on the valley floor. Jackson has more than 50 miles of paved pathways where you can unleash and let your dog go to town...as long as it’s under voice control. Routes follow the pristine Flat Creek and cross through lush meadows perfect for your pup. As you can see, Jackson Hole offers plenty of pet-friendly activities and there’s plenty more where that came from. And the more you do these, the more you’ll feel like a local and get off the highly trafficked park paths. Ready? 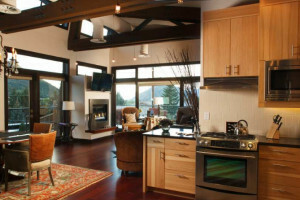 Unleash your Jackson Hole vacation!